You don't need a bread machine to make bread. You don't even need a mixer with a bread-hook. You don't even need a bowl! (but we'll use one because they are handy). You really only require the ingredients and an oven. 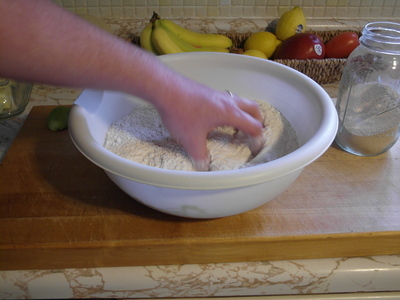 Using your hands to make bread instead of impliments and machines has a key advantage: Not all flours are the same, so if you are following a recipe exactly it won't turn out the same. 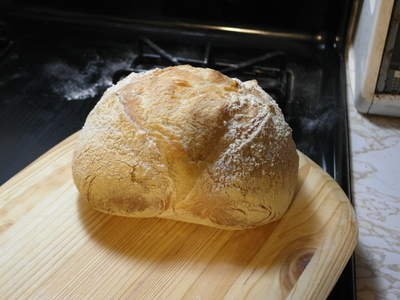 By making bread from scratch you'll know exactly if you need more or less flour and water to make the bread turn out ok. 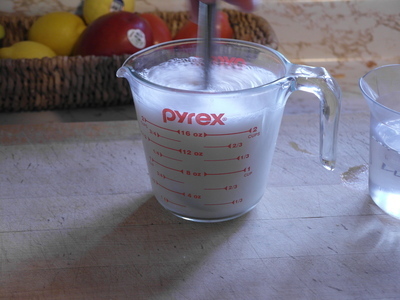 Most recipes I read have very precise measurements, like four and one quarter cups of flour. 1/4 cup? That precise? Thats less than a handfull of flour. The difference among various flours, bleached, unbleached, whole wheat, white whole wheat have used more than a full cup difference in flour to get the same consistency some times. So I suggest you find a flour that you like based on taste, and then learn how to adjust on the fly for the amounts of water/flour. It is really easier than it sounds and you'll never be locked into a recipe again. Suggestion: I strongly recommend using only unbleached flours. The taste is significantly better than bleached flours. 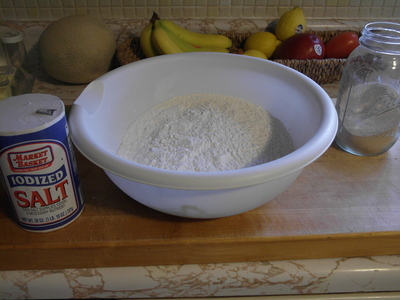 King Arthur is a brand commonly available that offers unbleached flour. 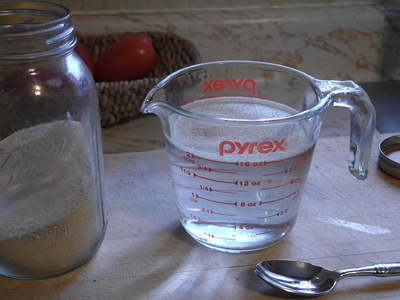 Add a tablespoon of salt to about 6 cups of flour and mix it up. Stir it up right before you add it to the flour. 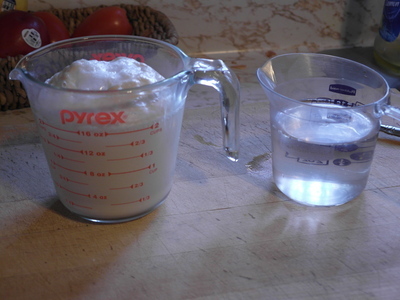 Yeast dissolved in water guarantees that it will be evenly distributed in the finished dough. 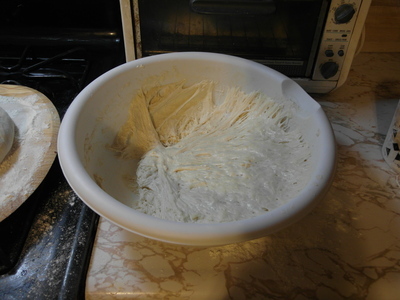 For other recipes where there is a long kneeding phase (e.g. 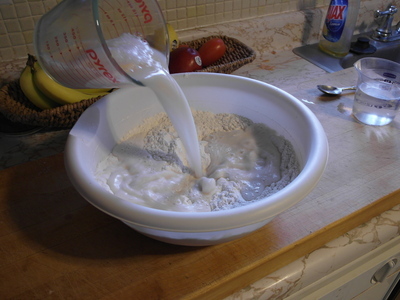 10 minutes), you can add the yeast right to the flour if you are confident that the quality is good. You want to get a substantially even distribution of moisture, but it doesn't have to be 100% even throughout. 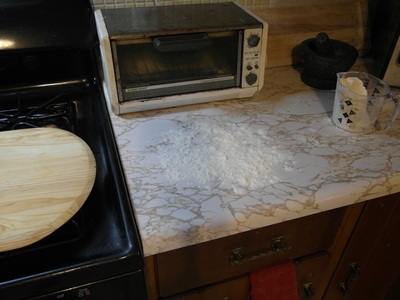 You just want to avoid having parts of totally dry flour. 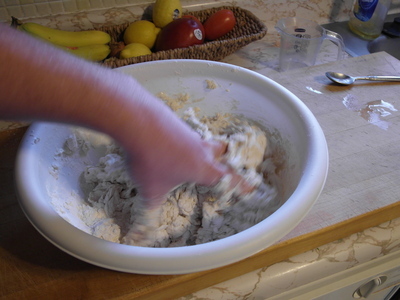 Using your hands work better than a spoon, and you need to learn how it feels to judge dough. 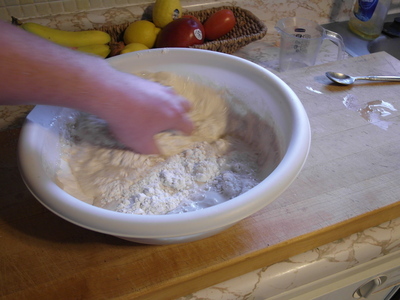 Since this "dough" is a bit closer to a batter than most bread recipes, the moisture will spread throughout during the rising step. 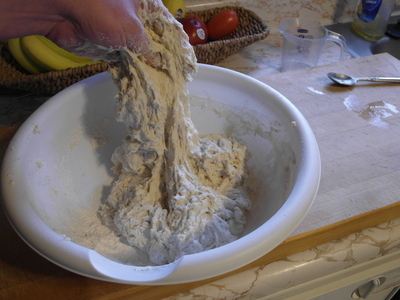 You don't need to spend more than one minute doing this, whereas most stiffer doughs require kneeding for 10 minutes. 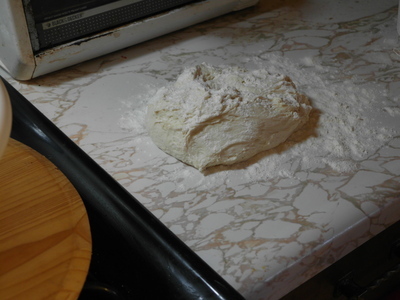 Cover and let the dough rise for a couple hours. 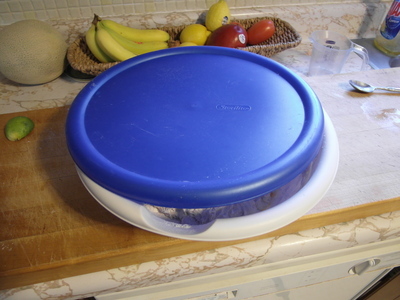 A large dinner plate can be put over the bowl if you don't have a cover, or you can use a damp towel. 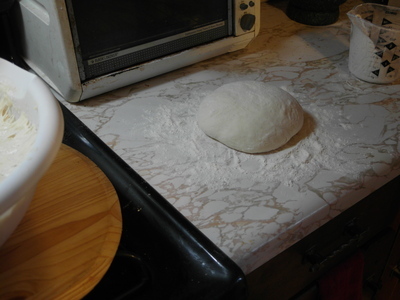 Your goal is to keep the dough from drying out on the outside so it can rise easily and to keep bugs/flies out. The dough will be soft and bubbly when ready. 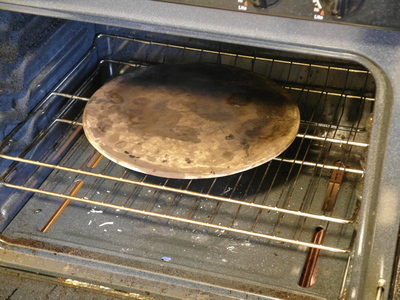 (optional) Place a pizza stone in the oven. The 450F (230 C) temperature is much higher than most recipes, but because our dough is so wet this works out well in our case. 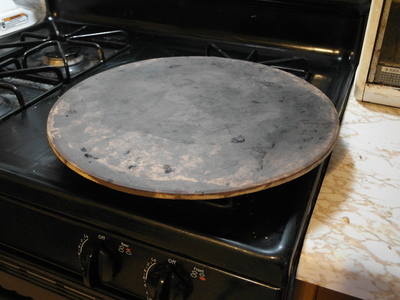 If you don't have a pizza stone, you don't need to put anything in the oven. 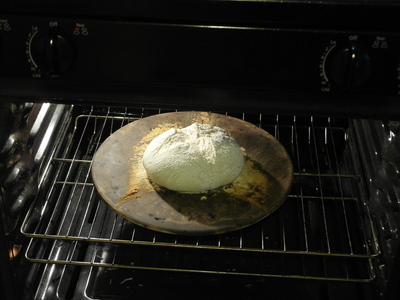 You can use a baking tray or cookie sheet or cassarole dish to put the dough on and put that in the oven when ready. 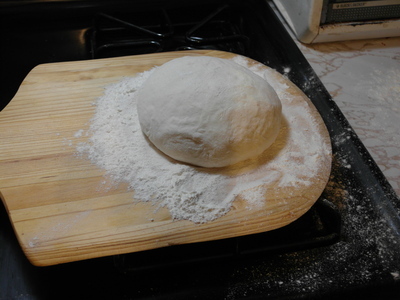 The pizza stone gives a slight but noticable advantage in rising because the dough is in direct contact with a hot surface, but I've baked bread for years before ever getting a baking stone so don't worry if you don't have one. 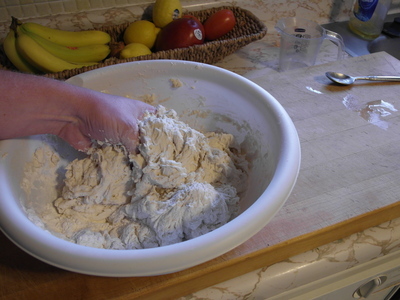 Shape the dough by pulling and folding the dough underneath itself. 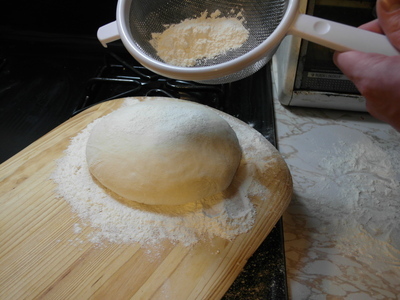 You can bounce it upside down to get more flour if you need it to handle with. You can't screw up the dough at this point, you are just shaping it. 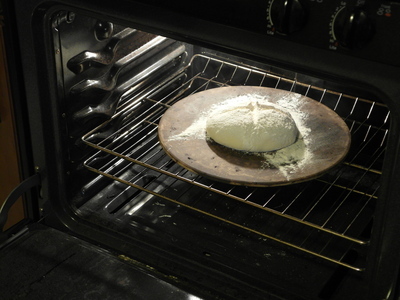 If you don't have a paddle to slide the dough into the oven, then place then the dough on a baking sheet/tray and let rise while the oven pre-heats. 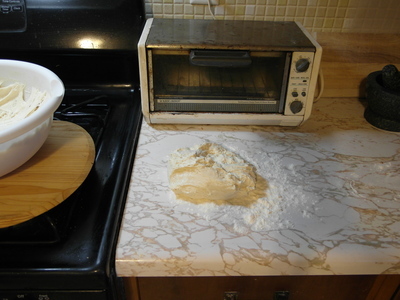 The slices in the dough are important because they act like expansion joints as the bread rises. 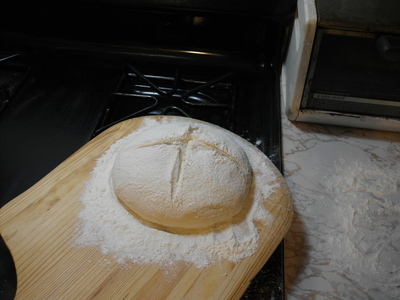 Without them the outside will bake/harden quickly, then as the baking continues the outside crust will either tear as it expands, or in the case of stiffer doughs result in a less risen and denser bread. A short 15 minute rise is appropriate. 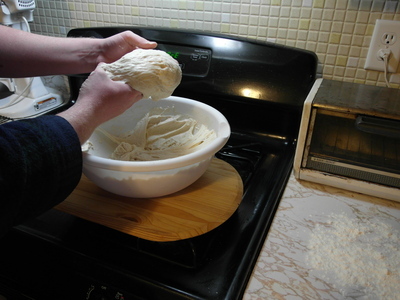 If you let the dough rise for 10 minutes after the oven has pre-heated it will be fine. 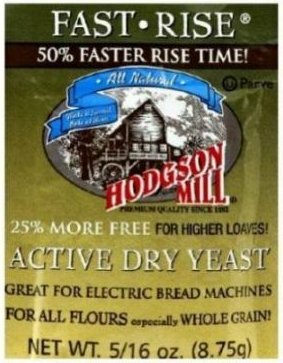 Most 2nd rise doughs are up to an hour, but because our dough is so wet it will keep expanding while cooking much longer than most breads. Bake bread for approxiametly 30 minutes. Judge doneness on color of crust. If you used a pizza stone and floured paddle, extra flour will be tossed into the oven. This will brown quickly and give off a small amount of smoke, but will stop in just a couple minutes. You want to take the bread out when the crust is a golden brown color like pictured. Almost all breads can be judged on their doneness on the basis of crust color, so pay attention to this. You can also take the bread out and thump the botton to see if it sounds hollow. 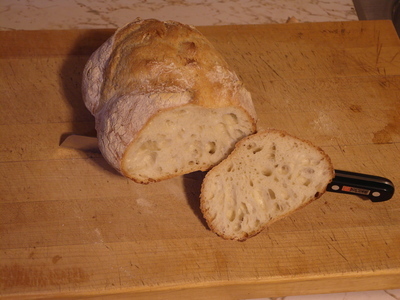 In my experience, the "hollow thump" test has really only worked for determine severely undercooked breads. You can have two hollow thumps, but by judging the color you'll be able to tell if it is fully baked and moist or fully baked and dry. When you first take the bread out of the oven, the crust will seem very hard and you might think that you over baked it. This is common for this recipe. The high temperature of 450F does make the crust hard, but there is still a good amount of moisture in the bread, so as it cools this seaps out through the crust and softens it. If you slice the bread immediately (I always want to), the first slice will taste fantastic, but once cooled the loaf won't be as good. 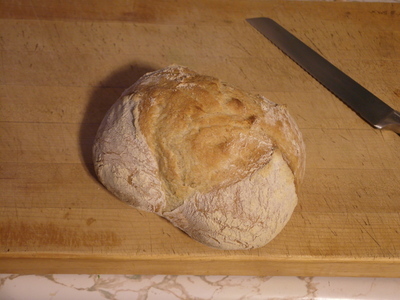 The bread will cool too quickly and you can be left with a damp and dense loaf. Cover the dough until you want to bake again, you should be able to get another couple of loafs out of this dough. 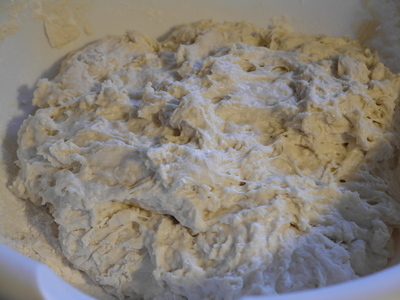 This dough will improve with flavor, because it will get a slight sourdough flavor over time. It does not need to be refridgerated, but I suggest using it within 10 days. 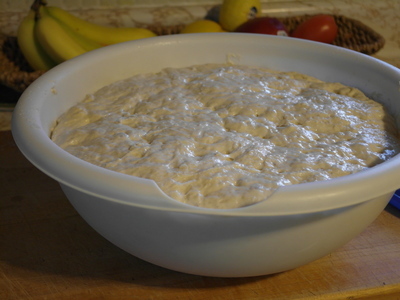 When all the dough is done, you can make your next batch in the bowl without cleaning it out, giving it a head-start on the sourdough flavor.